Apparently, the shark had been spotted 10 days prior to its washout, drifting unconscious 150 km off shore, and the causes of its death are still unknown, but scientists have taken samples in hope to discover what killed this giant. The corpse of the dead shark was sold for the amazing sum of 1700 rupees (17,500 Dollars). Now, before you get scared and panic that one of these amazing creatures might catch you off guard while you’re enjoying a swim in the ocean, you should know that they’re not called whale sharks simply because they’re enormous. This species of sharks live in tropical waters and despite their scary appearance and size, the only feed on plankton and occasionally, some small fish. The last documented length for a whale shark was 12 feet long, but it is indeed obvious that they can reach greater lengths. Not only do these gentle creatures do not pose any threat to humans, but they’ve actually been known to be quite friendly, and allow divers to swim on their backs. So you shouldn’t find it scary that whale sharks have a mouth that is 5 feet wide and it is fully equipped with up to 350 rows of tiny teeth. The person who bought the great giant is a local businessman named Haji Qasim, and he declared that: “I have bought the fish, which usually has no significant commercial value, with the help of my friends just to appreciate the efforts of the fishermen who deserve some reward after spending an entire day in the open sea”. 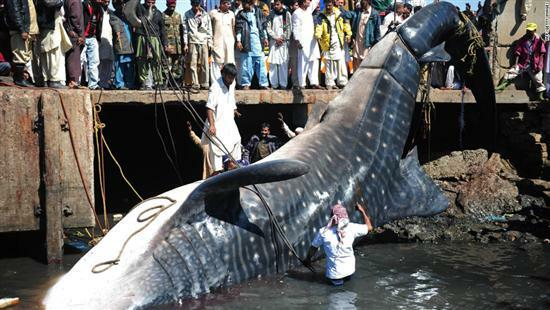 If you want to see how the local Pakistani authorities fished the giant shark from the water, have a look at the . So we’ve established that this big fellow is the largest shark ever caught, but how big were the previous record holders. Here’s a list with some of the biggest sharks ever caught. This big and scary fellow over here is the biggest bull shark in the world, caught so far. She’s actually a pregnant female, four meters long and weighing almost half a ton. This awesome creature was found 5.5 km up the Breede River, tagged for follow-up and released back into the wild. This amazing creature is certified as the world’s largest shortfin mako shark (Isurus oxyrhynchus). This is a man eating species, and this particular specimen weighed 1,221 pounds when it was captured and killed in 2001. A man named Clyde “Bucky” Dennis decided that he wants to capture a shark worth being mentioned in the records. The funny thing is that he actually did it, he managed to fish out of the ocean, the world’s largest Hammerhead Shark which was 14 feet long and weighed 1,2280 pounds. This is the world’s largest great white ever captured. The record was established on April 21, 1959. The tenacious fisherman was named Alf Dean, and he caught the 2,664-pound great white shark off the coast of Ceduna, Australia. No other larger great white has ever been caught since.